Abstract: Today we will be looking at three keyboards which seek to broaden your horizons by offering not just 104 keys, but possibly many other functions. I don't have to sit here and type in just how important it is work or game on a keyboard which is responsive, comfortable, and quick. A 'fast' keyboard with a sharp return, and well spaced keys is almost as important as a keyboard _here the "w" _orks properly. Badly made keyboards are hard to type on, and can cause serious medical problems after prolonged use. Well, these are all things we know, and none of this is very exciting. After all, a keyboard is just a keyboard right? They are used for typing, and sometimes they get trashed by a spelt coffee, or can of coke. Keyboards, no matter how important they are to our ability to interface with computers are essentially disposable these days. If they show the slightest signs of wear or poor service they are tossed out and another $10 replacement is found. Today we will be looking at three keyboards which seek to broaden your horizons by offering not just 104 keys, but possibly many other functions like CD-player control, power on, and web browser shortcuts. Since we don't believe it is really necessary to go into detail about each function (they are pretty much self explanatory after all) we will be going over each of the contestants from an overall perspective. Office Applications (word, excel, p. pont, calendar, lock), Windows (my computer, calculator, log off, sleep, power off), Internet Keys (back, forward, stop, www, email, favorites, refresh, search), Multimedia Keys (play/pause, stop, volume, mute, FF/REV), Mouse Scroll (up/down/left/right, back, forward, cut, paste, copy, mark, application launch, close), Tools (help, new, open, save, replace, bold, spell& check, bullets, reply, forward, send, task pane, print, undo, redo)& and a 104-key Windows keypad. By far the most short cut keys of any keyboard we have seen to date, the Viewsonic comes in a black and silver colour scheme which maches ViewSonics LCD flatpanels if you are into that level of coordination in your peripherals. For some reason, even though the integrated palm rest is really comfortable I don't find the keys of the KP202 quite as comfortable to use. The return is good, but the down stroke on the space bar is paltry and that just takes away from the feel of the rest of the keys. The chrome plated special keys are eye catching but I suspect the silver will ware off quickly. The integrated CD-player controls are really well done, but since the back of the keyboard is hollowed out, the unit is not that great for grabbing on to or using on the lap. Because of this, the left hand side cursor control seems more superfluous as we were only confident using a mouse with it. Typing comfort is pretty nice, but build quality feels a bit light. Standby, help, HP.com, shortcut 1/2, find, print, fax, Internet (connect, shopping, entertainment, finance, search, people, email), Multimedia (stop, FF/REV, play/pause, eject, mute, volume dial). Extra features: Two port USB hub. The HP keyboard is USB only which means it is good for new computers which tend to have more free USB ports then we know what to do with. There are a couple features that are particularly useful, namely the CD-Player controls, volume dial and two port USB hub. The integrated arm rest is a nice feature, and the flat back makes it comfortable to rest on you lap - but the entire package is a bit on the large side and suited best to sitting on a desk. Extra features: Light weight notebook type keyboard with 3mm keystroke. Condensed notebook type 88-key Windows keyboard with nice blue back light makes it ideal for working in dark locations. The Zippy EL-610 weighs less than 500 grams and is easily portable for use as a travel keyboard, or simply for presentation in dimly illuminated rooms. The keys offer a "mushy" stroke which is a little bit stiffer than comparable notebooks around the office here. 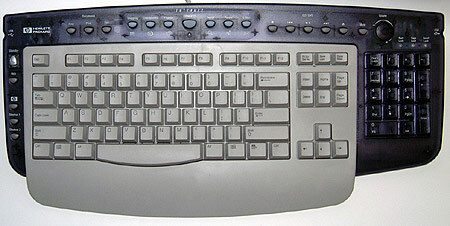 The keyboard doesn't require any special software and is fully compatible with Windows 2000/XP. For a small import, the build quality is nice but there is some flex if you are heavy handed. Last but not least, be warned if you spell coffee onto this little glowing bundle of joy! Notes: This is a standard 104-key Windows keyboard. The Logitech comes with a detachable arm rest which you can clip on, or toss out depending on your preferences. The keys offer the best feel of the three keyboards, but still don't manage to deliver the nice snap of the more traditional keyboards. The three shortcut keys are not ostentatious, and are placed well on the deck. There is a CDROM of drivers with this keyboard which unfortunately means you'll have to install yet one more piece of small software. The keyboard is easy to tote around and use on the lap if necessary. Build quality feels very nice. There you have it, three keyboards and our opinions on each one. For serious web-monkies the function crazy keyboards make a good time saving tool if you have the desk space to give up to their larger foot print. Of the three keyboards, the HP weighed the most and had the best set of useful features thanks to that USB hub. The Viewsonic keyboard was chocked full of short cuts, but I think most people will just use the mouse for most of them. The Logitech retails for the least amount of $$, and offers the least in the way of shortcut keys - but since it looks like a keyboard it won't confuse newbies as much as the other two might.